In my post of Mar 19 I mentioned I was participating in postal surveys through world-mail-panel.com. I started at the beginning of March and have received 22 surveys. I saw their ad on postcrossing.com and I registered. Soon after I received a Welcome email and information on what to expect. 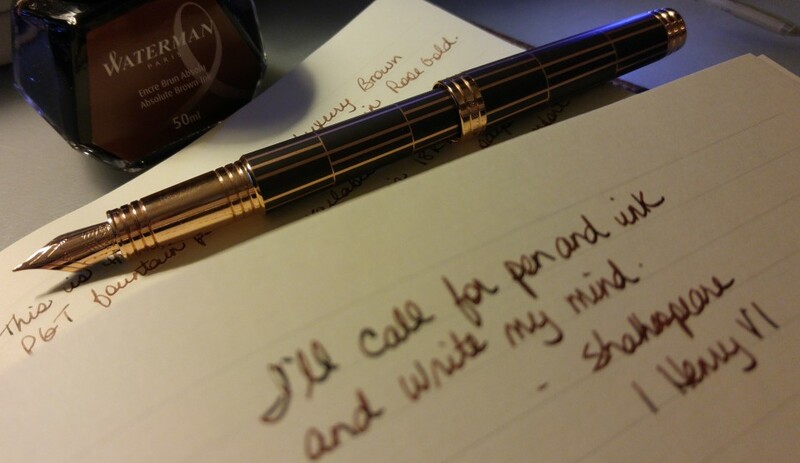 And then the letters started coming. Basically I receive letters and log information about them on the world mail panel website. They want to know the date the letter was received, if my address was legible, if the letter was damaged in any way, and the date of the postmark. It takes me less than a minute to log each one. There could also be a transponder (radio transmitter) included in the letters. Each of them has a tracking number and this also has to be recorded. 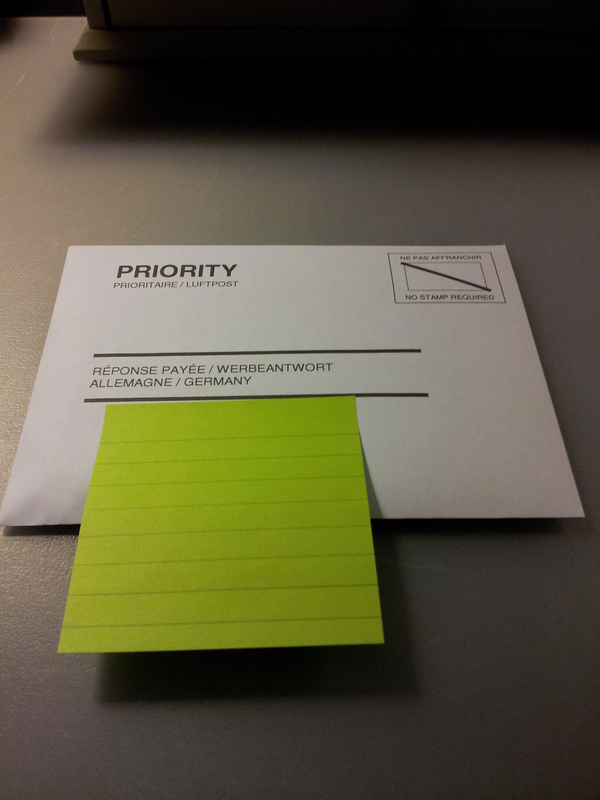 I am supplied with postage-paid envelopes to send the transponders back to their offices in Germany. And for this service I get paid about $15 US a month. This is paid out in gift cards for Amazon or Globoforce, deposits into a PayPal or Moneybookers account, or the money can be donated to Doctors Without Borders. Neat, huh? 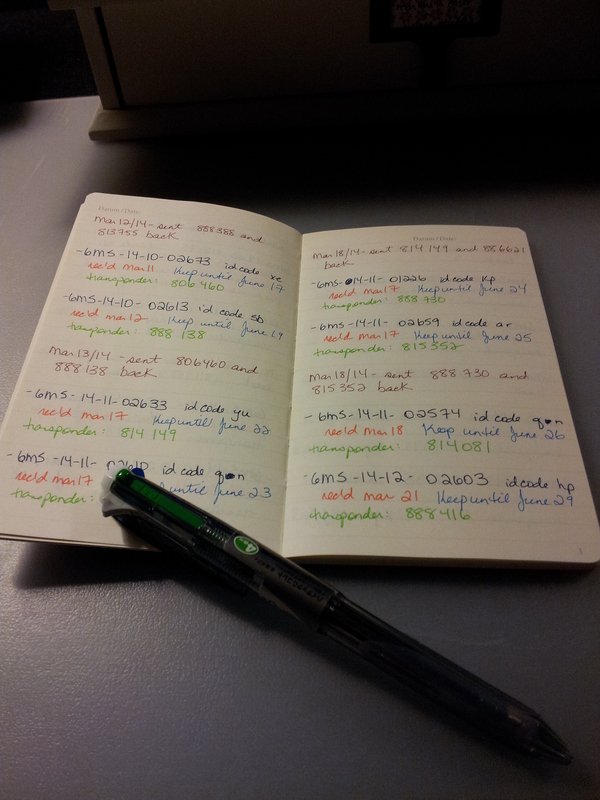 I’m also making use of one of my Leuchtturm JottBooks to keep track of everything. I wanted to write down when I received each survey in case there is some discrepancy with their records. 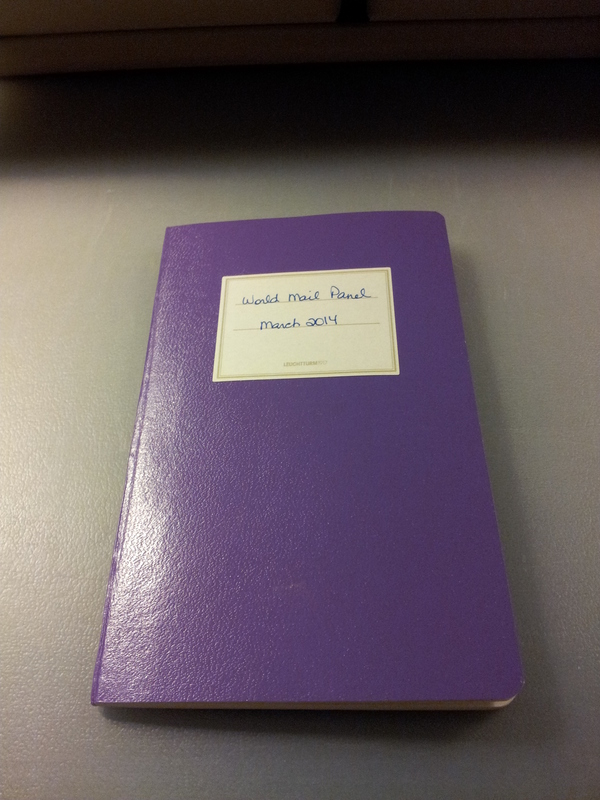 And you know I never pass up an opportunity to start a new journal! Each page looks the same; kind of like a secret code. 🙂 And here is one of their envelopes all ready to go in the mail. That’s about it as far as the surveys go. It’s an interesting way to get Amazon gift cards! If you are interested in registering click here. Keep in mind there is no guarantee of being selected; two of my coworkers have registered but so far have heard nothing. My registration was processed quickly so I guess there was a need in my area. If you do get selected have fun with it, like I am! So I finally signed up for an account on Postcrossing and I’ve got my first address – in Russia! I picked up some postage paid postcards for InCoWriMo and I thought I would use one for my first Postcrossing experience. 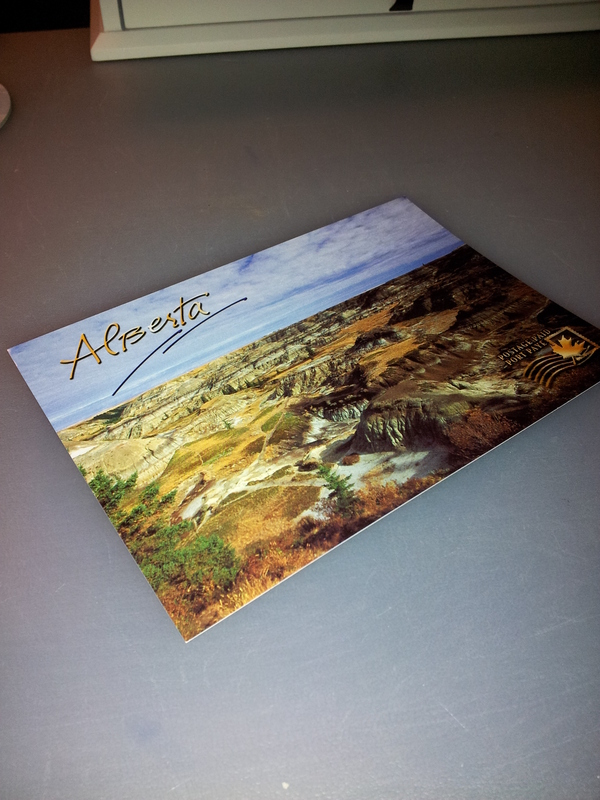 When you are given an address you are also given a tracking number to place on the postcard. When my recipient logs that tracking number in the system I can apply for another address. As it is this is only one of four addresses I am currently eligible to send a postcard to. So now that I’ve registered, my address is made available to other registrants. Which means I could receive a postcard from anywhere in the world! So exciting.